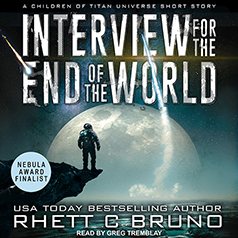 From the USA Today bestselling author of the Circuit Saga comes this Nebula Award–nominated short story set in his Children of Titan Universe. When a small-moon-sized asteroid is discovered hurtling toward Earth, billionaire-scientist Darien Trass must deal with the hardships of finding the select few who will join him on his voyage to escape the apocalypse and rekindle civilization on another world. From the USA Today bestselling author of the Circuit Saga comes this Nebula Award–nominated short story set in his Children of Titan Universe. If you found yourself curious about how the Ringers first came to settle Titan, you won't want to miss this!